MI6 caught up with Lynn Holly Johnson to talk about her varied career and her role as Bibi Dahl in the 1981 film "For You Eyes Only"
How did you get started in the acting world? Were you inspired by any actresses, and if so who? I had a lucky start and it was before I had the chance to be influenced by an actor or actress. I was a Chicago model as a kid. 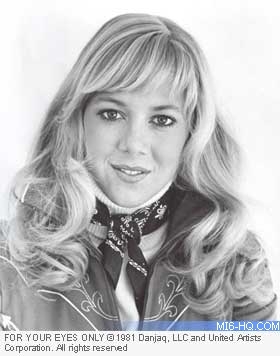 I did numerous commercials and industrial films and by age 12 I was more involved in skating – I became a competitive figure skater. I ended up missing auditions and skating really became my focus. So I put acting aside until I was on tour with the ‘Ice-Capades’. After my competitive figure skating career I was contacted by Columbia Pictures about this movie they wanted to do about a skater. It was kind of my lucky break because I had everything that this character had: I was from the Mid West and I was a competitive figure skater. The director badly wanted me for the role and constantly fought with the studios, who wanted to hire a well known actress, then have the figure skating dubbed in. So the director got me the role and one movie led to another and I ended up being lucky enough to work with Roger Moore. That only happened because Cubby Broccoli had seen ‘Ice Castles’ and really like me in it. So, once again, I was very lucky because he decided to write this character in for James Bond to go after. The role of Bibi Dahl was not an Ian Fleming character. So that’s really how I fell into the business before I got a chance to be moved by a single actor or actress. Before you made your feature debut in your first film, you were a medal wining figure skater and accomplished skier, how did this help your transition from athlete to actress? Well, the acting I did as a kid – I never really thought about. I was having so much fun doing it. As a kid you never really think about it or that much of the future. So I never really thought about when my mum would pick me up from school and I would go to a modeling job or an acting job in some little independent movie or industrial film and I never really thought I going to do this when I grew up. It never really crossed my mind. I was just a kid and it was a day-to-day deal. So I was training very hard to be a competitive figure skater and doing very well – I was second in the country in 1974. The following year I broke my leg and I was out for the entire year. That’s when I moved to California and started training with John Nicks in Santa Monica. He was world famous as a coach. It was at that rink the director and the producer from Columbia Pictures were looking at skaters, and figuring out how they were going to do the movie. That’s how my name came up because I had trained at that rink and it was really, really lucky because if I hadn’t moved out here from Chicago, my name probably wouldn’t have been in the running for that picture. The funny thing about it, which always surprised me, is that when I graduated from eighth-grade, before high school, they presented each kid with a school yearbook. The people that were putting pieces of the year book together about whose most likely to succeed and what will they do and in the future. I don’t ever remember having any thoughts about that, but I do remember reading in the yearbook it said that, ‘Lynn Holly Johnson will be doing a movie on the ice’. I thought that that was so funny that they just kind of combined my two passions in eighth-grade and then there it was, by the time I was 17, that’s exactly what I was doing. "For Your Eyes Only" featured some great skiing sequences. Can you tell us about how these where filmed? How much of your athletic skills did you use in shooting the film? I was lucky in that my parents were very athletic and they always had us out skiing from when we were really little – and other sports. 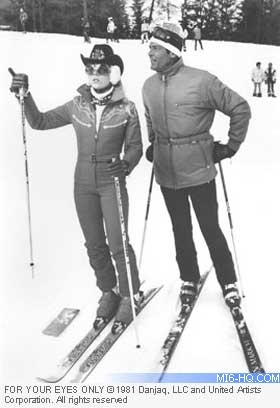 I did know how to ski very well and that made Cubby Broccoli happy. We had a ball working in Cortina, doing the skiing sequences. I was in Cortina on location for around 5 or 6 weeks and on the days that I wasn’t working, my sister and I were up on the Dolomites, just skiing the day away with a fine Italian ski instructor who was quite handsome. We just had great fun skiing, four days a week. Because I wasn’t working all that much in Cortina I would go and practice skating – for a while there, they had a lack of snow even though I believe it was February. So there would be times when there wasn’t any snow down low and there was only snow way up high. European resorts are not like the American resorts, where everything is well organised and very simple. Skiing in Europe is much more rugged, much more exciting, a much greater challenge and really fun. Anyway, they don't have it all spelled out for you when they run out of snow at the bottom of the slope and they don’t have a chair to get you up or down all the way. So I would hop on the back of Roger's stunt double, Wolfe Junginger, and we'd ski down through the grass, where the snow had already melted. He was such a phenomenal skier – I would just be holding on for dear life while he went down on the grass, in and out of the trees, it was really quite a thrill. They were amazing people to work with: Willy Bogner and his whole team, shooting the entire second unit skiing, tatoboggan and motorcycles sequences. They were a blast. Do you have any other special memories of your role in “For Your Eyes Only”? One of the best parts is that many years later I still get to talk about Bond and at the time of the role I had no idea it would go on and on and on. I mean Bond really does live forever and it's wonderful to still be able to talk about this. Every time I do an interview it brings up certain memories that I am just so fond of and I wish I could remember every single day on location, with all those terrific people. So many of the crew have worked together on the previous Bonds and it makes for a really wonderful team because they know how to make the picture right. They know what works, they know how to work with each other and it makes it really special, it's a family and I've never had that feeling working on the a set before. Working with Roger is a wonderful memory he was so fun and genuine and such a charismatic wonderful guy. He wasn't arrogant. He was having a ball – he was so fun playing Bond and getting on with everybody. My sister was with me the whole time as my chaperone and he treated the both of us like gold. He was a wonderful fellow. The Royal Premiere is a great memory to standing there with Roger, Topol and Cubby, meeting Prince Charles and Lady Diana. That was quite an evening. It was really a ball. Roger was always playing practical jokes on set. Can you share a few of them? There's a few lascivious jokes that I'd rather not repeat. Just let you know that he is hysterical and unbelievably clever. You just never know what he was going to say. I can't repeat some of the things. I'll just have to leave it at that – he’s a ball to work with. I always thought it was funny, the little bits of frustration that would build up between the writer and the director and the producer because it would always take Roger five takes before he would say the scripted line. He always had something clever or fun to say. When we did the scene when I was in Roger's bed, it was shot right before Christmas. My parents had come over to England to spend Christmas with my sister and I. It worked out perfect because I would not normally consider taking my parents to the set – it's a huge no, no. How do you concentrate on what you're doing? This was integral to my performance because I was supposed to be this character who decided on getting into James Bond's bed and inviting him in. The character is meant to be completely childish and silly and you know having my parents there just made me giggle, and Roger kept saying things like ‘I would jump in the sack but your parents are here’ with my parents there. So it was a riotous day, I have to say. What was it like working with the director John Glen? It was fantastic to work with a director who had already been an editor on some of the previous Bond's. It was neat to watch his face while directing, because you could see in his eyes that he was already cutting it together. He knew exactly how it needed to be. It's like working backwards, having been the editor and now being the director. So he was doing this puzzle in his mind and it was really interesting to watch. He knew exactly what shots angles he needed. I've never worked with a director who’s been an editor already, on the same type of movie. So that was really quite an experience – and his personality, he is a lovely fellow. I would have worked with him every day. He was brilliant! He was very kind and an excellent director. He really kind of set me right on the path I was supposed to be on. You were 22 years old when you got the role, not that much younger then latest bond girl Eva Green. What were your impressions of the James Bond phenomenon? Well it's funny you know, when I was cast as a 20-year-old I kind of played more of a 16-year-old. Isn't that funny how the times have changed? I was cast as a very, very young Bond girl and that was kind of the whole deal, is he going to get involved with this girl so much younger? Here we are 25 years later and girls that Bond does go after are exactly the same age that I was. So you know times have changed definitely. But the world is changing and it's completely accepted. I think the Bond is played younger and so it's not such a disparity in age. I'm not saying that Roger was old when I worked with him but certainly everyone knew he was playing an older character, which made the difference in age very interesting. I would love to have seen Roger go on and on and on – he was terrific. So many people that I talk to realise I was in ‘For Your Eyes Only’ and rave about Roger, and just want to know how he's doing. Just seems like Roger should have been still working in the Bonds today, working as someone such as M or Q or someone like that. People sensed that he was fun. In 1979 you were nominated for a Golden Globe, “New Star of the Year” award, how did it feel being nominated for such a prestigious award? I was in England at that time working with Betty Davies in ‘Watcher in the Woods’. So it would have been different if I were in the US and being nominated, because there's always all the more hullabaloo have that kind of stuff here in L.A. It was very cool! I just couldn't believe it – you know, to be up against Bette Middler who was quite a name already, it was a thrill. I flew home just for the event. The Golden Globe is a different set to the Oscars because it's a dinner party and you are seated at tables with 8 or 10 others. I sat there at a table with Jane Fonda and Marsha Mason and Neil Simon and it was quite an unbelievable evening. The public is more in tune to the Golden Globe now. It was very fun I didn't care at all whether I won or lost, it was just about the event itself and being there. I'd don't believe my life would have been any different today if had I won. Your last film was “The Criminal Mind” in 1996, do you still intend to pursue your acting career? Can you tell us if we will be seeing you in anything in the near future? Well I’m working with a production company right now where I'm directing independent shorts. I'm trying to hone my skills as a director on these little short movies and I'm having a ball. They're letting the rights so I'm kind of dabbling in the business on a very small scale. But that's fine, because I have a family and they are the priority and I get to do these little projects. It's very fun. Being a mum I love doing all of this, creating a home for this family, but I kind of miss out on the creativity of the acting business. So in the past couple of months I've started working with these people and it's been very interesting. I've spent the last three years sailboat racing and have been two-time national champion, so I've been very busy. Right now I’m being creative with film. I've been teaching some acting classes and have been a guest speaker at acting seminars. Thanks to Lynn Holly Johnson.